Gulfside Elevator’s Traction Home Elevators save you space without sacrificing your safety. Designed to accommodate all the equipment in the elevator’s hoistway overhead which eliminates the need for additional space outside the hoistway. Our traction elevators utilize the same electronic controls and fixtures as our hydraulic model, enabling us to provide our customers with the best service both during installation and long after. This ensures our customers will have the safest and best running elevators in Southwest Florida. Gulfside Elevator’s Traction Home Elevators have a capacity of 950 LBS, traveling speed of 40 feet per minute with a max travel distance of 50’-0”. All lighting in our elevators are of energy-efficient LED technology. 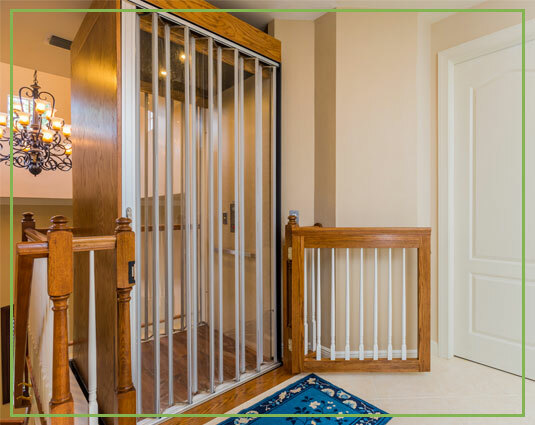 Gulfside Elevator’s Traction Home Elevators are a great fit when an elevator needs to be retro fitted into an existing house and conserving the homes interior space is a must. The pit depth required is 12” and the minimum overhead space required is just 8’-6”, which will allow for a cab height of 7’-0”. Gulfside Elevator’s traction elevator cabs are built custom in our Naples facility to give you both the maximum allowable cab size and to coordinate aesthetically with the rest of your home. Our standards are other companies’ upgrades; to learn more about our cab interior selections please visit the Cab Interiors section. Our traction home elevators are furnished with overspeed governor car safeties that are activated by the elevator traveling at a greater speed than 40 feet per minute. Gulfside Elevator provides and places door interlocks on all existing hall doors so that the hall door cannot be opened if the elevator is not at that floor. As a standard feature for homes in low lying and coastal areas where the ground floor is below flood elevation, Gulfside Elevator installs a pit float switch; when activated by water, the float switch will send the elevator to the designated floor above the flood elevation. All elevator models at Gulfside Elevator have built-in emergency lowering systems which allows for the elevator to safely descend to a lower floor level in a power outage. All our safety devices are tested and certified in accordance with the American Standard of Mechanical Engineers (ASME A17.1) Safety Code for Elevators.